If you visit often or pay any attention to my Instagram feed you might have noticed that I’m a bit of a pasta fan. I’d happily eat it most nights. And leftover Pasta Sandwiches for lunch, because all the carbs! I love pasta in many different forms but perhaps my favourite thing about it is that there are so many different things that you can do with it. You could have pasta for dinner every day for a month and never eat the same thing twice. It’s so versatile, it’s always filling and it works with so many different flavours. 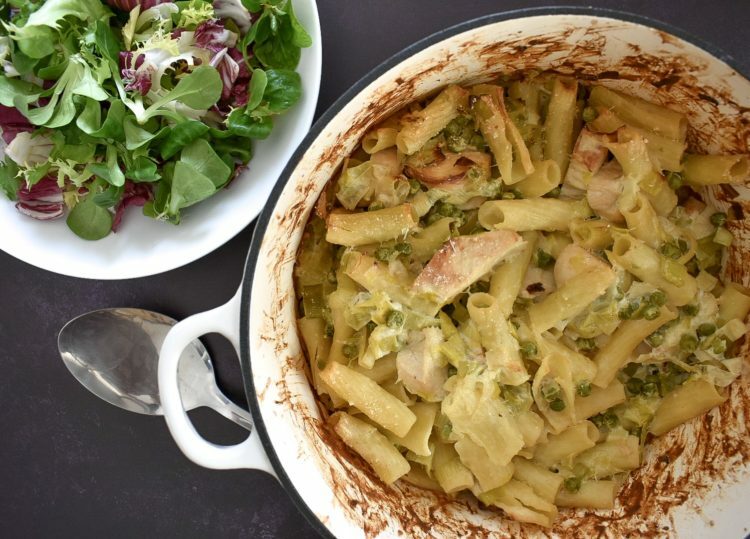 Chicken and Leek Pasta Bake is a brilliant pastay family dinner. Perfect for when you want something comforting, and even better with a glass of white wine. 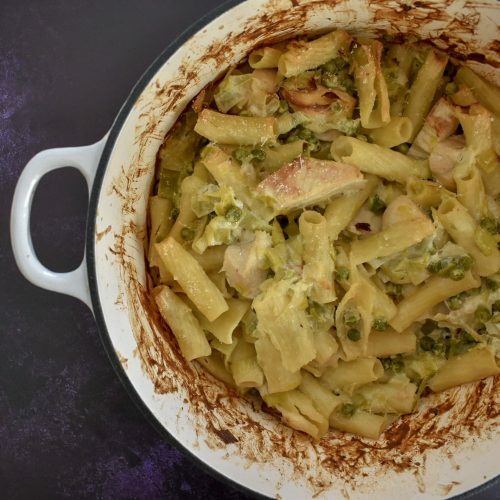 Chicken and Leek is a classic flavour combination. 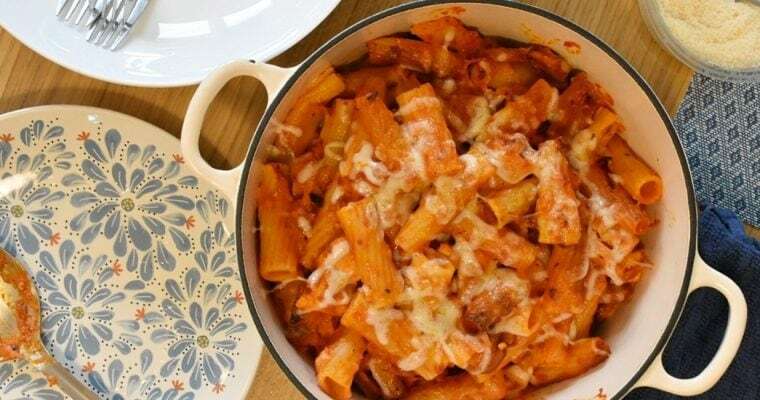 In a creamy sauce, it’s perfect as a pie filling, as well as being a cool Pasta Bake flavour. 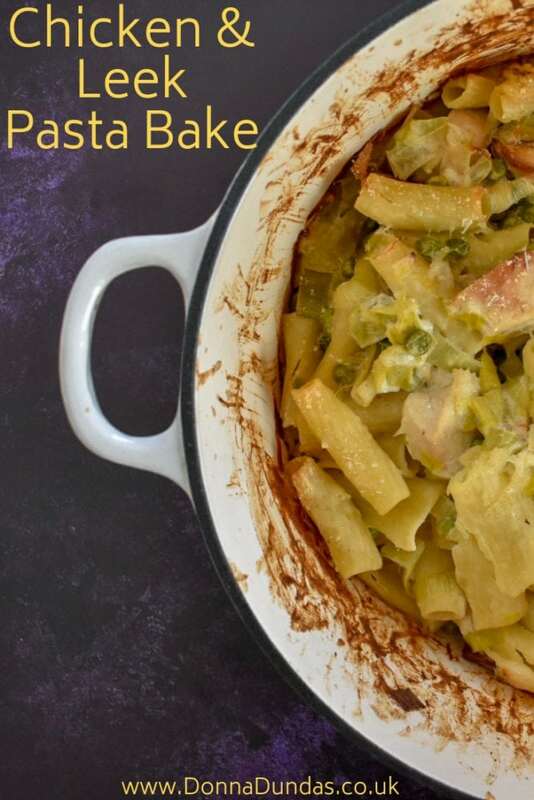 My Chicken and Leek Pasta Bake is easy, tasty and filling. 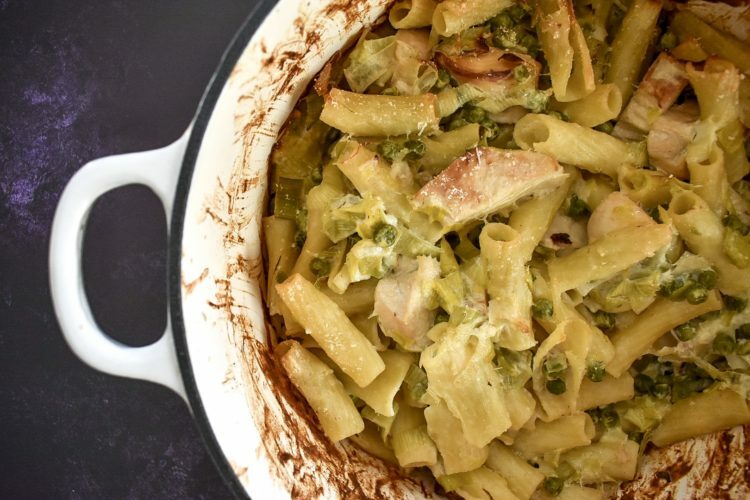 It’s a perfect weeknight dinner for the whole family to enjoy. If you’ve got any left, pop it in the fridge where it will be good for a few days, and reheat when you want it. If you prefer not to use white wine, simply add some extra stock instead. It won’t have quite the same tang, but it’s still a really nice meal, and if you don’t like white wine, you wouldn’t want the tang anyway. If you’re not a pea fan, spinach is a great alternative. You could also add bacon if you wanted something a little extra. I use frozen chicken breasts, so I cook them off before starting, but fresh are fine too. A simple and filling family dinner. I serve with salad and garlic bread. I use frozen chicken breasts, which I precook before starting. I then add them with the leeks.